Following up on what I mentioned yesterday about the difficulties of visiting brandy producers in Normandy, we woke up this morning after a late night at Camut with a two hour drive to the Domfrontais region of Calvados awaiting us (yes, it's possible to drive for over two hours and still be in Calvados). We were scheduled to meet with Frédéric Pacory, one of our favorite producers in all of France, and from there we would drive another hour and a half back over to the Pays d'Auge for a visit with our old friend Astrid Hubert. We had nearly four hours of driving to do just to meet with two individual producers, but only the truly dedicated wind up with the best booze! The weather was wet and cold, but our hearts were warm with anticipation. We pulled into Pacory around noon, just in time to have lunch and put together a few orders. If you're wondering what makes a Domfrontais Calvados different from a standard Pays d'Auge, the Domfrontais brandies generally have 60% or more pear distillate in the eventual blend, adding an entirely different dynamic to the flavor. Located on the ferme des Grimaux, the Pacory property has been in the family since 1939, but it wasn't until 1959 that Frédéric's father Claude decided to try and perfect the art of Calvados distillation. The torch was passed to Frédéric in 1986 and he's been carrying the tradition forward ever since. One of the interesting aspects of Pacory's production is that Frédéric likes to fill at higher proofs than other producers typically do. Pacory's orchards are 100% hautes tiges, meaning the trees are higher and older in age (as opposed to bas tiges orchards that look more like grape vineyards with their tiny trees in vertical rows). It ultimately takes longer to grow the fruit, of course (as you have to wait many years for the trees to reach maturity before harvesting), but the resulting produce is of a much higher quality for two reasons: 1) the yields are lower and the flavors more concentrated, and 2) hautes tiges trees allow for farm animals to co-exist in the orchards. The cows that live in Pacory's orchards help fertilize the soil with their manure and eat many of the weeds that grow around the trees. 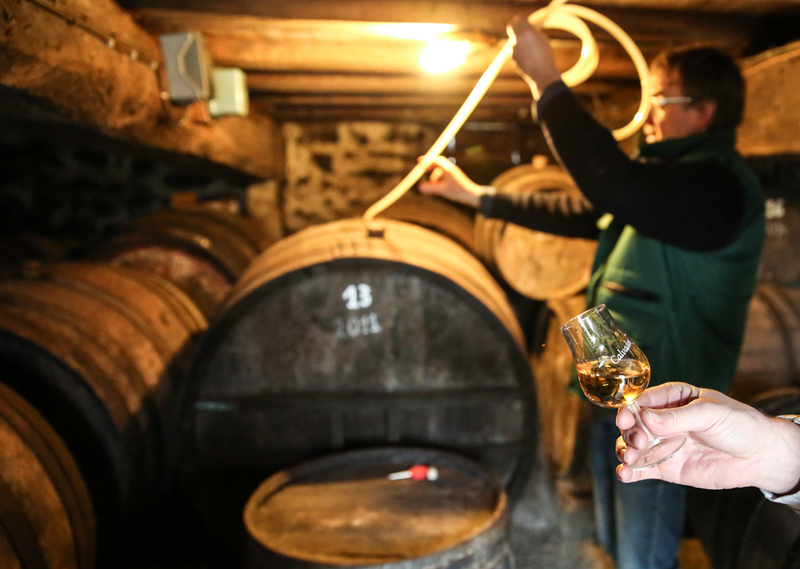 It's a symbiotic relationship that creates healthy fruit and ultimately higher-quality Calvados. After tasting through some new expressions (another high proof 100% pear edition and an older 2004 single vintage), we headed back into the kitchen for lunch. The word had gotten out around town that the latest batch of Pacory Poiré cider was available this weekend, so while we ate a few locals came by to purchase their cases. Frédéric's wife Christine would periodically head over to the other kitchen table to take the cash and write out the receipts, while we continued to eat and taste through various cider expressions. Pacory makes a vintage pear cider called L'Idea that is fermented in the bottle like Champagne and disgorged in the exact same way. We popped a bottle while cutting through our steak and green beans and I had what was easily an epiphany over the quality. Expect at least ten cases of the L'Idea to show up with our next batch of Pacory Calvados as I think we'll have excited K&L locals showing up with a similar level of enthusiasm once they get to try it. The longer I remain in the booze business, the more I come to value the close relationships I've formed over the years and appreciate the people who are an absolute pleasure to work with. Astrid Hubert is one of those people and we've sold so much of her Pays d'Auge Vieux expression at this point that we're by far her largest client (thousands upon thousands of bottles out the door). Few things in life at this point make me as happy as finding success with people I adore and respect. Astrid is like a burst of bubbly energy that never quits. She's constantly smiling, making funny faces, telling self-effacing jokes, and reminding me of how much I like her. She's also tough as hell, one of the few woman I've seen running an entire estate in Normandy from harvest to distillation. We tasted an advance sample of the new Vieux blend, based primarily on the 2008 vintage with bits of 2006 and 2010 blended in. It's textbook Astrid—friendly, feminine, but with a bit of a spicy kick. Anxious to build on the success we've had with the standard Pays d'Auge expression. I asked Astrid if we could taste some older vintages as well. I didn't want to dig back into her father's work as the style is a bit more rugged in nature and I really appreciate Astrid's delicate hand, so I decided to cap it at 2006—one of the vintages in our blend, isolated on its own. The amount of oak spice intermingled with the clean and fresh apple flavor was breathtaking. However, it was an completely unexpected addition to the line up—a Poire Williams pear liqueur—that had me jumping up and down, hugging her with excitement. We've got a lot to look forward to later this Spring. We finished the evening with a quick stop at a new property for me called Le Lieu Chéri, run by Fabrice Desfrièches and his son Alexandre. 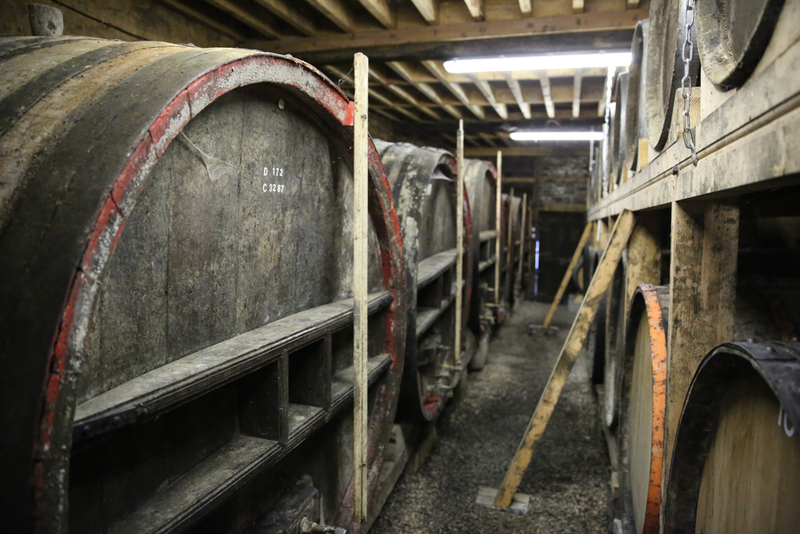 It's always amazing to me how many different styles there are of apple brandy because the spirits here were finer, less fruity, more spice driven, yet entirely wonderful in their own way. They tasted nothing like the Pacory and Hubert editions we had enjoyed earlier in the day, yet their robust and somewhat savory character satisfied my palate in a completely different manner. I'm going to look at their ten year old Hors d'Age selection as a potential candidate down the line. We've got a lot to work with. Tomorrow we're off early to Bordeaux for a date in St. Emilion with Château Barde-Haut. The driving never ends!